Can Poland surpass India as a destination of choice for outsourcing? With India holding a 55% share of the IT-BPO global market and about 80-95% of the software development export segment, this might be a pipe dream. However, no marketing strategist worth his salt will take his eyes off the market leader even knowing full well that there are many hurdles to clear along the way. One way to achieve this goal is for Poland to focus its efforts on the IT outsourcing segment of the market for which it is highly qualified. Research conducted by Dr. Brendan D’Cruz of the University of East London Business School identifies the main reasons for outsourcing as “cost savings, better product quality, faster delivery times, access to scarce skills and improved efficiency”. Without having to enter into a price war for the cheapest services, Poland is well-positioned to compete in all the other value propositions by focusing on ITO. A U.S. International Trade Commission report places call center services as accounting for 70% of India’s total outsourcing business, 20% from high-volume low-value work and only 10% from high value-added jobs. Herein lies the advantage of a destination like Poland which can offer access to world-recognized IT personnel at, not the lowest, but affordable costs. A Booz Allen Hamilton study shows that the market for IT outsourcing will grow from $15 billion to at least $150 billion by 2020. Another study by Strategy + Business forecasts that outsourced services primarily for cost reasons will drop by 26% in 2015. Conversely, the study predicts that the outsourcing business driven by quality will increase tenfold. 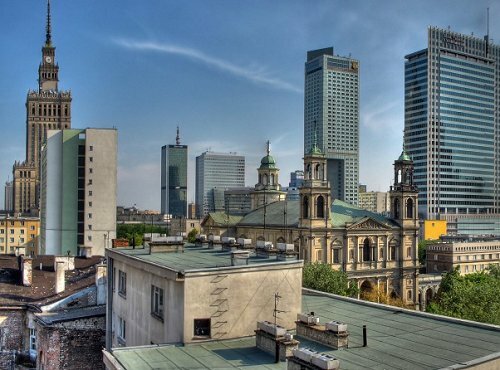 The first advantage of Poland as an IT outsourcing destination is its location. As a bridge between Western and Eastern Europe, Poland’s location is unmatched, not just by India, of course, but also by other Eastern European countries like Hungary, the Czech Republic and Russia, which have their eyes on the same market. 80% of the BPO business of India comes from the US market, which is pushing for on-shoring its outsourced business. By contrast, in favor of Poland’s potential, 63% of all developed countries are in Western Europe, making it the largest conglomeration of buyers across the world. The next advantage that Poland has comes from access to its highly-skilled and efficient talent pool. IDC Research has shown that Poland ranks highest among all European countries with 80% of employees possessing the required basic IT skills. This compares with the UK, a Tier 1 provider, at 58% and far ahead of other Eastern European competitors. The high English proficiency of this talent pool and the comparatively lower salaries of IT professionals only reinforces this advantage of Poland as an outsourcing destination. A study conducted by Knowledge Systems and Research, Inc. shows that “Best-in-Class IT Expertise” and “Pricing Competitiveness” are two of the three First Tier multiple choices criteria for buyers of outsourced services. In the same study, “Stability” ranks highest in the Second Tier criteria. As part of the European Union, Poland is a relatively low geopolitical risk compared with providers in less stable parts of the world, and possesses infrastructure and communications facilities in line with EU standards. This, in turn, makes it possible for Poland to provide the product quality and faster delivery times that are among the major reasons for the choice of a service provider. The signs look favorable for Poland. A Tholons/Global Services study ranks Poland as one of the “5 Next Offshore Nations”. Among the Top 50 Emerging Global Outsourcing Cities, Krakow ranks No. 4 and Warsaw No. 28. Recognizing this advantage, the world’s biggest names in information technology have outsourced operations to Poland. To name a few: Google, Samsung, IBM, Microsoft, Motorola, HP, and Siemens have opened up knowledge-based development centers in the country. Motorola located its first European software development center inKrakow (or Cracow). Siemens Sp. Z o.o., located in Wroclaw, coordinates twelve subsidiaries of the company providing sophisticated software engineering services. If it plays its cards right, Poland just might find itself at top someday. We’ll be happy to advise you on selecting an outsourcing supplier in Poland or other CEE countries. Clone attack in Russia continues. What's next?